Behavior, psychologists explain, is context sensitive. In other words, what you do is dependent on your environment. Not just your external environment - consisting of the room you're in or the leisure environment you enjoy - but your internal environment; your thoughts, attitudes and emotions. Feel happy, and you begin to smile or do 'happy' things. Feel angry, and your behavior will change. Just trying to 'behave' in a particular way doesn't work for very long and is tough to keep up, but, if you change your inner environment, you'll automatically behave differently. You don't have to remember to smile when you feel happy - you just do. With Powerbubbles™ a person can change their inner world: thoughts, attitudes, and emotions, knowing that their outer world will immediately become different, better. Interestingly, it works even when you pretend, because the brain doesn't easily recognize the difference between pretend and reality. Pretend that you're happy for a while - and pretend that you're not pretending - and your mood will change, you'll actually become noticeably happier. Your inner self retains its integrity because it knows you are choosing to pretend, like an actor in a film. There is nothing false about that. And you'll find that the external changes will ACTUALLY grow new neurological pathways in your brain so that you become happier in reality. There are all sorts of ways people use Powerbubbles™ to make their own and other peoples' lives happier. You can use the Powerbubbles™ concept to increase creativity, improve your interview success, do presentations, and strengthen your confidence. It even helps you to be kind, loving and joyful. Powerbubbles™ is a psycho-visual concept for overlaying or replacing current internal representations with ones that are more useful in the circumstances. 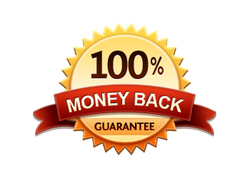 Rooted in cognitive behavioural and auto-response psychology, it is a Personal State Management tool that enables the client to access conscious and unconscious emotions, states and behaviours, and either reroute them, or simply re-write them. It is the user-interface – the keyboard, mouse and screen – of the computer of your mind. 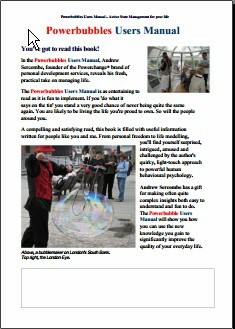 The Powerbubbles™ concept is being used by all sorts of people to change their lives - buy this easy to read book to learn more!